Copperhead is a 2013 drama film directed by Ron Maxwell and starring Billy Campbell, Angus Macfadyen, Augustus Prew, Lucy Boynton, Casey Thomas Brown and Peter Fonda. The film is based on a 19th-century novel, The Copperhead, by Harold Frederic. The title refers to Northern opponents of the American Civil War, known as Copperheads; it was shot at Kings Landing Historical Settlement in New Brunswick, Canada and is set in upstate New York. It was released in the United States on June 28, 2013. In a rural community upstate New York in 1862, farmer Abner Beech is a Northern antiwar Democrat. While his neighbors take up the Union cause in the ongoing American Civil War, Beech believes that coercion in resisting the secession of the southern states is unconstitutional, and gradually becomes more and more harassed for his views, derisively called a "Copperhead". His son, Thomas Jefferson Beech, enlists in the Union Army. Beech also arouses the ire of militant abolitionist Jee Hagadorn, whose daughter Esther (Lucy Boynton) loves Jeff. The film had the working title Copperhead: The War at Home. Filmed at Kings Landing Historical Settlement in New Brunswick, Canada, Jason Patric initially starred, but was replaced by Billy Campbell after production commenced due to what director Maxwell called "creative differences". Copperhead was produced by Ron Maxwell and co-produced by John Houston. 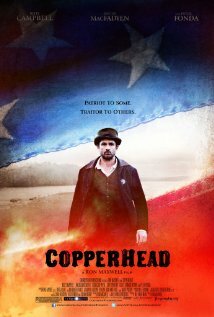 Copperhead opened in limited theatrical release June 28, 2013, playing in 59 theaters and was simultaneously released in video-on-demand platforms including Amazon Video. The film ultimately grossed $171,740. On review aggregator Rotten Tomatoes holds an approval rating of 21% based on 19 reviews, and an average rating of 4.74/10. On Metacritic, which uses a weighted average, the film has a score of 34 out of 100, based on 12 critics, indicating "generally unfavorable reviews". Stephanie Merry of The Washington Post gave the film two out of four stars, remarking, "The story offers uncommon insights on the endlessly parsed period in history, but its execution sometimes falls short. Both the production quality and the persistent, sentimental soundtrack create a made-for-TV feel" Mark Olsen of the Los Angeles Times shared similar criticism, opining, "Where Tony Kushner's screenplay for Steven Spielberg's Lincoln found energetic drama in political wrangling and historical events, Copperhead crams far too much of its action into its last 30 minutes after a rambling, drawn-out set up. Painfully lugubrious, any sting Copperhead might contain for its contrarian's view of history is undone by its wayward sense of storytelling." Christine N. Ziemba of Paste magazine wrote Copperhead a fairly mixed review, stating "Despite good performances throughout the film, the pacing of Copperhead is slow, with many long takes and establishing shots that seem a bit over-indulgent, as if to remind viewers that they're watching an 'important, yet little-known, historical drama.'" Despite ultimately giving the movie a mixed review, John DeFore of The Hollywood Reporter optimistically stated, "Theatrical prospects are meager [...], but history buffs may appreciate its earnest look at an underexplored subject on small screens." Copperhead is Maxwell's third Civil War film, though the director does not consider it to be part of the trilogy he has planned along with Gettysburg (1993) and Gods and Generals (2003), as he expects to conclude the series with a final film based on Jeff Shaara's The Last Full Measure. ^ Ron Steury (August 15, 2016). "Would You Have Been a Copperhead?". Cinema Faith. Retrieved March 5, 2019. ^ a b "Copperhead (2013)". Box Office Mojo. Retrieved July 28, 2013. ^ a b Vlessing, Etan (May 28, 2012). "Copperhead Shoot Embraces New Brunswick". PlayBack. Brunico Communications Ltd.
^ Patten, Dominic (June 5, 2012). "'The Killing's' Billy Campbell Replaces Jason Patric on 'Copperhead'". Deadline Hollywood. Retrieved July 10, 2013. ^ "Copperhead (2013)". Rotten Tomatoes. Retrieved March 7, 2019. ^ "COpperhead reviews". Metacritic. CBS Interactive. Retrieved March 7, 2019. ^ Merry, Stephanie (June 27, 2013). "'Copperhead' movie review". The Washington Post. Retrieved June 30, 2013. ^ Olsen, Mark (June 27, 2013). "Wayward pace tarnishes 'Copperhead'". Los Angeles Times. Retrieved June 30, 2013. ^ Ziemba, Christine N. (June 27, 2013). "Copperhead". Paste. Retrieved June 30, 2013. ^ DeFore, John (June 25, 2013). "'Gettysburg' director Ron Maxwell looks at Northern opposition to the Civil War". The Hollywood Reporter. Retrieved June 30, 2013. ^ Raleigh, Brendan (May 30, 2013). "Maxwell's 'Copperhead' to Strike on Screen for Civil War Anniversary". Frederick Gorilla. Frederick, Maryland. Retrieved May 30, 2013. This page was last edited on 19 March 2019, at 13:38 (UTC).